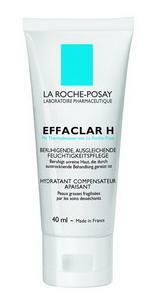 Effaclar H moisturizes oily skin made fragile by over-drying skin care. It also brings the lipids that this skin specifically lacks to reconstitute the protective hydrolipidic film and contains Ceramide 5 (patented ingredient) to reinforce the skin barrier function. It thus restores comfort and suppleness. Rich in La Roche-Posay thermal spring water and Bisabolol to soothe irritations and redness. Non comedogenic. Tested under dermatological control. Result: The skin is soothed and intensely hydrated. It is durably comfortable. Apply morning and evening on a cleansed and dry skin. Aqua, Sqaualne, Glycerin, Cyclohexasiloxane, Propylene Glycol, Butyrospermum ParkII/Shea Butter, Caprylic/Capric Triglyceride, Peg-100 Stearate, Glyceryl Stearate, Peg-20 Stearate, Bisabolol, Tea-Carbomer, Ammonium Polyacryloydimethyl Taurate, Disodium EDTA, Hydroxypalmitoyl Sphinganine, Tetrasodium EDTA, Xanthan Gum, Cetyl Alcohol, Stearyl Alcohol, Myristyl Alcohol, T-Butyl Alcohol, Citric Acid, Tocopherol, Sodium Benzoate, Phenoxyethanol, Methylparaben, Propylparaben, Parfum/ Fragrance.